Sometimes a taco journalist asks himself if all the long nights at the office are worth it. He may wonder if he is reaching his audience and whether his hard hitting journalism might be hitting too hard or not hard enough. If he is lucky, then on days like today a taco journalist is proud to learn that he is named the “Best Street Taco Connoisseur” in print. 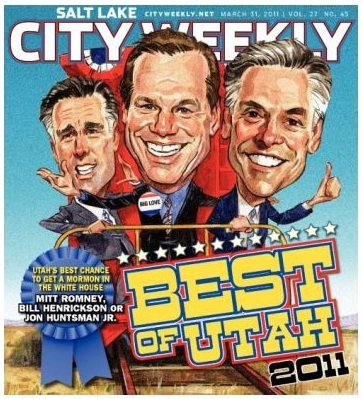 City Weekly has published their annual “Best of Utah” issue and your truly has received this award. There are hundreds if not thousands of people who deserve this award so I am humbled to have received this honor, which is only slightly lesser in grandeur compared to the coveted Congressional Medal of Tacos. With this honor comes responsibility and I know I have work to do. I want to extend thanks to everyone who reads this site and to everyone in the world who loves tacos. We all have our food passions, but not many turn those passions into an invaluable resource for others. From a simple mission statement that he summarizes as, “I love tacos!” Kelly Peterson has set out to chronicle the restaurants and street vendors who serve up Salt Lake City’s finest collections of meat, cheese and condiments wrapped in a tortilla. Reviews and taco-related ephemera are part of the regular blog postings that have given fellow tacoficionados an invaluable way of guiding their gastronomic wanderings. This entry was posted in Uncategorized and tagged awards, city weekly, duty, honor, tacos, utah. Bookmark the permalink. Ca fait trop longtemps, toi! HAHAHAHAHAHA!!! Ben, a mon avis, lo, les meilleurs tacos sont ici-meme a Salt Lake. Alors, quand est-ce que tu veux visiter? Je te promets des tortillas super plein de fromage. K’s-tu penses, toi? Tu viens quand, lo?